The center core of SpaceX's second Falcon Heavy rocket sits atop the drone ship Of Course I Still Love You after the successful launch of the Arabsat 6A satellite April 11, 2019. Rough seas later claimed the booster. Elon Musk's company successfully landed all three first stages of its Falcon Heavy megarocket last Thursday (April 11) during the huge launcher's first commercial mission. Two of these boosters came back on land and one, the central core, touched down on a "drone ship" in the Atlantic Ocean, off the Florida coast. But the central booster didn't complete its homeward journey intact: Rough seas claimed that first stage during the drone ship's voyage back to shore, SpaceX said today (April 15). "Over the weekend, due to rough sea conditions, SpaceX's recovery team was unable to secure the center core booster for its return trip to Port Canaveral," SpaceX representatives said in an emailed statement. "As conditions worsened with 8- to 10-foot swells, the booster began to shift and ultimately was unable to remain upright. While we had hoped to bring the booster back intact, the safety of our team always takes precedence. We do not expect future missions to be impacted." The news was first reported today by The Verge. SpaceX has pulled off two dozen drone-ship touchdowns to date, all but one of them involving first stages of the company's workhorse Falcon 9 rocket. 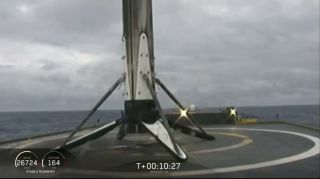 This is the first time the company has lost a landed stage on the way back to port. The Falcon Heavy's three first-stage boosters are modified versions of Falcon 9 first stages. As The Verge noted, the Heavy's central core has a slightly different design than the Falcon 9 first stage, because the former must link up with two side boosters. SpaceX therefore wasn't able to secure the Heavy core to the drone-ship deck using its "octagrabber" mechanism, as the company does during the transport of Falcon 9 first stages. However, modifications will apparently allow the octagrabber to aid future Heavy missions. Thursday's launch, which successfully lofted the Arabsat-6A communications satellite, was the second ever for the Falcon Heavy, the most powerful rocket operating today. During its first flight, a test mission in February 2018, the Heavy sent Musk's Tesla Roadster into orbit around the sun. SpaceX landed the two side boosters during that mission but came up short with the central core, which just missed its drone-ship target. SpaceX also recovered both halves of the Heavy's payload fairing during Thursday's mission, securing hardware that costs $6 million. The company plans to reuse the fairing and the two side boosters that touched down on terra firma that day. In Photos: SpaceX's 1st Falcon Heavy Rocket Test Launch Success!